The Continuum caught up with TMNT co-creator Peter Laird earlier this week to discuss the series and other things Turtle. THE CONTINUUM: How does this series compare to the other? PETER LAIRD: It's going to be much better. It's really more in the spirit of the original comics. And the short description of that spirit is, I look at the original comics as an adventure story told with humor. And the original animated series was a humor series told with a little adventure. And we're flipping that around so it's more like the original comics series. That's the approach we're taking. THE CONTINUUM: How involved are you with the show? PETER LAIRD: A lot more than the first time, believe it or not. From the original decision to start up the new series, which I think was last June, I've been working really closely with the head writer, Lloyd Goldfine. He's been pretty much in daily contact with me. The script level, looking at premises, looking at treatments, scripts, designs � the whole nine yards. I've done a little drawing myself for some of the design work and have been right in there from the very start. I've had a lot of input. THE CONTINUUM: Why did you choose Fox for this? PETER LAIRD: It was a deal that kind of fell in our lap. 4 Kids had a relationship with Fox and they wanted something to fill this spot and this block of time they bought in the Fox Box. We hooked up with them and it just seemed to work with them perfectly. THE CONTINUUM: Would it be safe to say this version is a little more sophisticated? PETER LAIRD: I think so. It's something that's a little more appealing to me at my age. Of course, we're always keeping in mind that we're trying to make it appealing to kids. It's something that has more adventure and more grittiness to it while maintaining a level of fun. It is much closer to the spirit of the comics than the old show was. THE CONTINUUM: There seems to a pendulum that swings toward the amount of violence that can be shown and recently the standards have been pretty tight. Is it swinging the other way? PETER LAIRD: I don't know. I never really watched that much animation to tell the truth. I don't think this is really going to be violent, per se, but there's a lot of action in it. I don't know. That's a good question. I don't have a good answer. THE CONTINUUM: Is there an age group you're trying to reach or do you think the property transcends that? PETER LAIRD: I think that the actual goal, and it's a difficult one, is to appeal to both older kids and adults and younger kids who would be the ones that would buy the toys that Playmates is going to produce. We're trying to walk that fine line between something that would be really appealing to kids and fun but also be sophisticated and adult enough to make it watchable by adults or older kids, teenagers. THE CONTINUUM: Are the episodes standalone or are there plot threads that go throughout? PETER LAIRD: One of the things that excites me a lot more about this whole series is that there is a story arc that goes through the entire season, all 26 episodes, and while some of the episodes are, in fact, standalones - you could watch them without seeing anything else and get the gist of them - there are a lot of continuing episodes. In fact, the first three episodes are all linked. It's one of the neat things for me - there's a development. With the old show it was basically, boom, in the first episode you knew everything about all the characters and then it was sort of repeating over and over a similar story in each episode. This series is not going to be that way. We're going to be developing a sort of growing tension in each episode, things are going to be connected and characters who were in early episodes are going to reappear. I think it's going to be a helluva lot more fun. THE CONTINUUM: Can you describe the main arc? PETER LAIRD: Basically, it's the story of how the Turtles come to, encounter, learn about and deal with The Shredder. And there's a lot of stuff in between that. There's a lot that doesn't even have anything to do with The Shredder. But that's the overall, basic arc. THE CONTINUUM: Why do these characters remain so popular? Is it a case of a new generation discovering them every few years? PETER LAIRD: That's quite possible. I think the characters have been popular from the beginning. We certainly didn't consciously, through some genius, figure out to make really cool, popular characters. But we hit on something and I think respond really positively to them. And I'm not really sure what the reason for that is. In practically every media that they've been in, they've been received really well. People dig 'em. THE CONTINUUM: Speaking of other media, what else is going on with the characters? PETER LAIRD: The toy line is back. Playmates has produced some really neat toys. They started shipping in December of last year: the whole line of new action figures, vehicles, giant-sized action figures, which are really neat. We've got the cartoon coming out, obviously. Twenty-six episodes of that. We're working with Konami, who was the very first video-game licensee for us years ago. They're producing a wonderful new video game with much greater, cooler computer technology that's available now. And we're also working with Hallmark Entertainment to develop a two-part, live-action TV movie. I think the plan for that is, if everything goes well, to get that out next year sometime, probably in the first half of 2004. There's a lot of other licensing stuff going on. There's even a monster truck in development. That's going to be pretty neat, actually. THE CONTINUUM: And as for comics? PETER LAIRD: I'm planning to continue doing my bi-monthly black and white TMNT book with Jim Lawson, Eric Talbot, and Mike Dooney -- eight issues out on schedule so far -- got my fingers crossed! -- as long as I can and as long as it's still fun. There are also plans in the works to revive the old Tales of the TMNT comic that we used to publish, possibly doing that so it comes out in the months between the regular TMNT issues. That could happen this year. Tales" would also be published by Mirage. There are also talks in process with Dreamwave Comics about them doing a color TMNT comic, written by Peter David and based on the new animated series' universe. Nothing definite so far, though. Let these Turtles show you the true way of the Ninja. The Teenage Mutant Ninja Turtles are back and have come to flip, spin, kick and crush the evil Foot Soldiers and Shredder. They won't stop until all of New York City is safe. 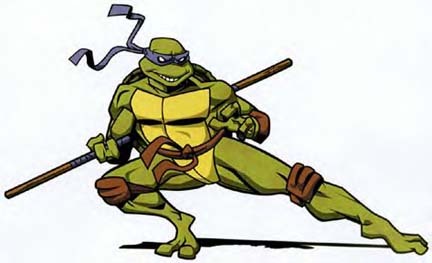 Leonardo is the unofficial leader of the Teenage Mutant Ninja Turtles and an expert with his twin Katana Swords. Whether out on his own or leading his brother on a dangerous mission, Leo is always the one to keep his cool. But when the fighting begins, he's usually the one to finish it. This fully poseable deluxe 12-inch Leonard figure comes with two Katana Swords. Collect them all.